Watch this short video or read the details below! Microsoft is focused on increasing active usage of Office 365. In order to boost their customer adoption rates, they chose a solution that provides an on-demand training which follows users around and provides support specific to what they are working on. This solution allows organizations to quickly get their users up-to-speed on all things SharePoint and Office 365 with step-by-step interactive guidance and in-context help at the moment of need. Microsoft is funding 90 days of VisualSP service for many of their Enterprise Customers. To get started, your Customer Success Manager can simply nominate VisualSP. Contact your Microsoft representative or contact us directly for more information. VisualSP has helped hundreds of organizations around the world increase Office 365 usage as well as their adoption rate of SharePoint. At VisualSP, our goal has always been to help users with organizational change; end users don’t want to be trained they want to be helped. They are always thinking, "What’s in it for me?". Our unique system helps users understand how they can perform their tasks and also reinforces processes, so they don’t revert back to their old ways. This is known as Performance Support. In other words, Performance support refers to enabling users to fully understand the tools they use by providing help to accomplish their daily tasks. In many cases, executives think this understanding is achieved through training. Performance support for Office 365 and SharePoint usage, is enabling users to do their jobs without having to rely on classroom training or searching the web for relevant help. Performance support is crucial to both getting user buy-in on the first day and sustaining better company-wide adoption as more users collaborate within Microsoft’s tools. End users want to learn tasks faster and managers want adoption to happen quickly. For example, imagine a scenario where we need our users to stop sharing files directly from their personal OneDrive and start sharing their files through SharePoint. Guidance is provided directly in context to their environment so the next time they show up to OneDrive they see a dialogue that says there is a better and easier way to share files. When they click the ‘Find Out More’ button within the dialogue, they are automatically redirected to the appropriate document library and a VisualSP Walk-thru instantly pops up and guides them through the library. They are prompted to learn different features of the library, such as sorting, filtering, uploading documents, and how to search. This gives users the understanding they need to get the job done right. The complete VisualSP program consists of User Adoption as a Service (UAaaS), a framework of services in conjunction with the VisualSP Help System, providing real-time help, which has boosted adoption rates for organizations around the globe. Within the VisualSP Help System tracking usage with analytics allows administrators to understand what applications are being used and really dig in deep to see what help content their users are accessing. However, due to data protection laws, all data can be anonymized as needed. VisualSP customers have reported more than a 31% increase in user adoption and a reduction of support calls by more than 24%. 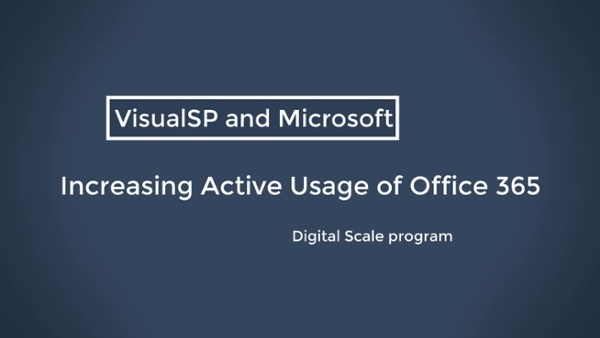 Microsoft customers can get signed up for 3 free months of the VisualSP help system when they are nominated through Microsoft’s Digital Scale Program. To find out more about how to boost your usage of SharePoint and Office 365, read the article, "Four Best Practices for Better SharePoint User Adoption".